They say that you haven’t had a proper pasty unless you’ve been to Cornwall, UK. I grew up on Corned beef pasties as we call them in the UK and if you ask anyone they will tell you the history behind pasties and Cornwall, hence the name. Corned beef pasties (Cornish Pasty) were common meals for those who worked in the Cornwall mines because they were considered a meal-in-one. The pasties are short crust pastry stuffed with meat (typically beef) and vegetables, sealed then baked in the oven. My version of the UK Cornish pasties are Corned Beef Puffs which are savoury flaky and sure to fill hungry bellies. Don’t let corned beef in a can (also known as salt beef) scare you away because it’s delicious and certainly a staple in many homes around the world. Another popular recipe you might be familiar with is corned beef and cabbage. My corned beef pastry can be eaten hot or cold which makes them perfect for an on-the-go meal instead of stopping off for fast-food. If you double the recipe you can pack extras in your lunch for work or for sending the kids off to school. 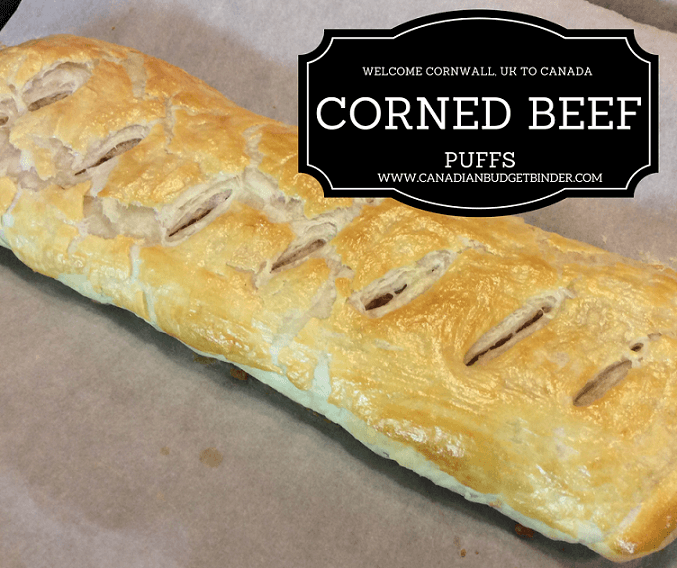 I also like to bring my corned beef puffs when we go to sports events for the kids as a dinner on the go. I knew you would ask. Corned beef is a salt-cured beef product. The term comes from the treatment of the meat with large-grained rock salt, also called “corns” of salt. It features as an ingredient in many cuisines. Beef cured with salt only has a gray color and is sometimes called “New England corned beef”. Often sugar and spices are also added to recipes for corned beef. Did you know that corned beef was one of the main foods a serviceman was given in his pack during the war? Corned beef in the can keeps well and is a great source of protein. Corned beef in a tin is a must-have staple in our pantry which my family loves prepared in a multitude of ways. Corned beef is great for hearty sandwiches, corned beef hash, corned beef and cabbage. The list is endless as it’s so versatile. Having frugal recipes like this beef and potato stuffed pastry when money is tight is something we rely on in our family. I am always looking to create new recipes with corned beef in can as you can easily tweak them to your own tastes. Where to buy corned beef? Prices for corned beef in a can will vary from $1.00 a can on sale to $5.00 depending on the brand that you purchase. I usually wait until it’s on sale to stock up on it since it keeps so well. A quick savings tip– If you go into the Chinese food section at the grocery store you will find cans of corned beef cheaper up to 10 cents compared to normal shelf stock in the other aisles. I find lots of great bargains in the international aisles so it’s worth a look if you’ve got time to see what is being offered. 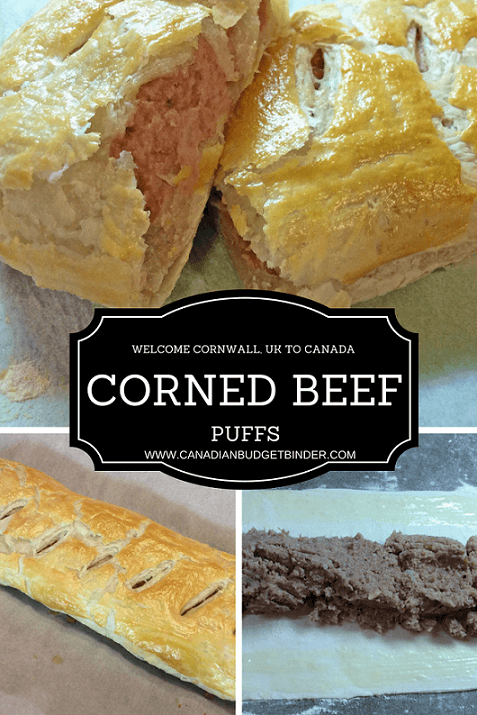 These corned beef puffs are actually sold in the UK by a well know baker called Greggs. They own bakeries all over the UK and offer both savoury and sweet products at a pretty reasonable price. 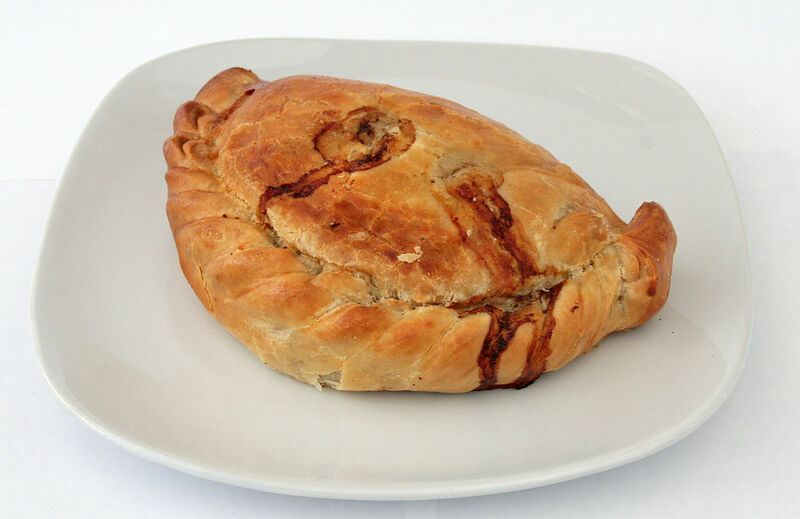 In the UK we call these Pasties which are well-known and devoured because they are so good. 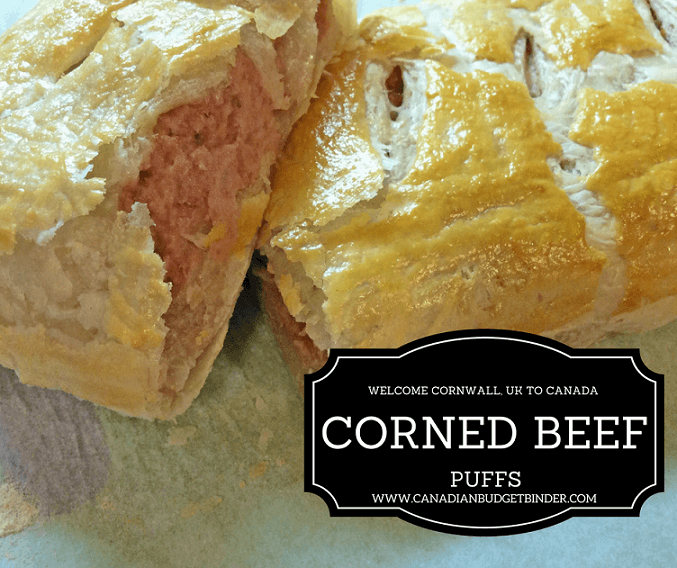 Corned Beef Puffs are savoury and perfect to eat hot or cold which makes them top pick for on the go or in family lunches. Peel and cut potatoes into small pieces, place into water and cook until soft. In a small pan fry onions in oil until clear, drain and also place to the side. Once the potatoes have cooked drain and mash the corned beef and onions together until they are well combined. The corned beef will melt into the hot potatoes pretty easy. Let cool. Open the puff pastry and roll out. Depending on which kind you get you may not have to roll out the pastry at all. Place this on a grease proof or lined tray as it will be easier to roll up once the mixture is in. In the middle of the pastry equally place the corned beef mixture. Brush the egg all around the edges to seal the pastry. Roll the pastry round the corned beef mixture. Press down all the sides. It will look a bit like a flat log. Brush the top of the pastry with the rest of the egg. Make small slits along the top of the pastry to let steam out. Place in the oven (400oF) for 20mins or until brown and puffed up. 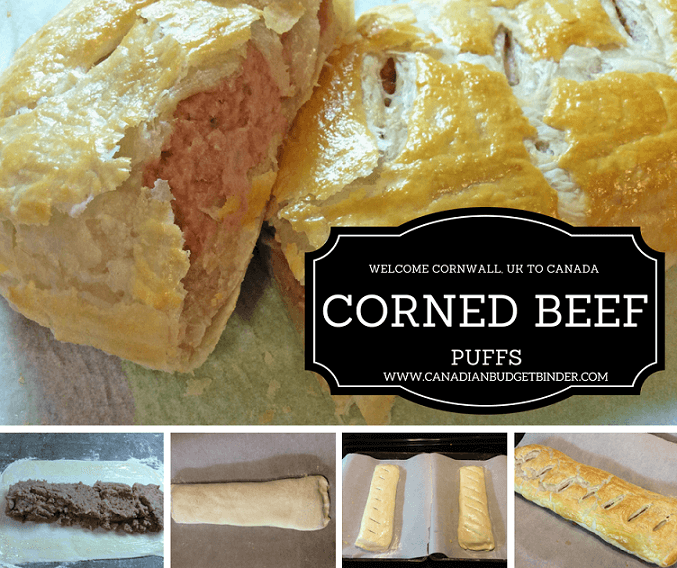 So why not give my corned beef puffs a try at home to see just how easy they are to make and how you can add your own twist to the recipe. If you do leave me a comment because I’d love to hear about how you made this recipe your own.